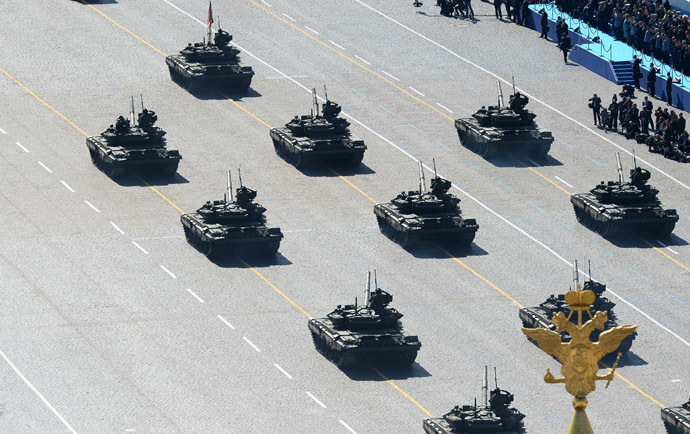 T 90 tanks during the V-Day Russia has celebrated the 69th anniversary of Victory over Nazi Germany in the Great Patriotic War (WWII) with a traditional May 9 military parade on Moscow’s Red Square, which featured 11,000 troops, 149 military vehicles and 69 warplanes. The clock on the Kremlin’s Spasskaya tower rang its chimes at 10:00 AM Moscow time to signal the start of the Victory Day parade. The right to bring out the official flag of the Russian Federation and the Victory banner this year went to the servicemen of the Preobrazhensky regiment, which has been carrying the honor guard service in Red Square for over 55 years. The original Victory Banner is the red flag, which was mounted by Soviet troops atop the Reichstag building in Berlin on May 9, 1945 as a symbol of victory over the Nazis. After Russia’s defense minister, Sergey Shoigu, inspected the servicemen gathered for the parade, he reported to the commander-in-chief of the Russian armed forces, the country’s president, Vladimir Putin. "It's our country which chased the Nazis to their den, and achieved their full and final defeat, won at the cost of millions of victims and terrible ordeals. We will always guard this sacred, unfading truth, and we will not allow the heroes to be betrayed or forgotten – everyone who saved peace on the planet, not sparing oneself [from death]," Putin said. The parade was traditionally opened by a drummer squad of the Moscow Military Musical College, who set the marching rhythm for the 11,000 participating officers and soldiers. The infantry representing all branches of the Russian army as well as military academies have made their way across the 256 meters of Red Square at the pace of 110 to 120 steps per minute. The inclusion of the Special Forces units has become one of the innovations of the current parade as they marched in protective uniforms providing supreme protection from all the basic types of bullets, with Val silent machine guns and VSS Vintorez sniper rifles in their hands. 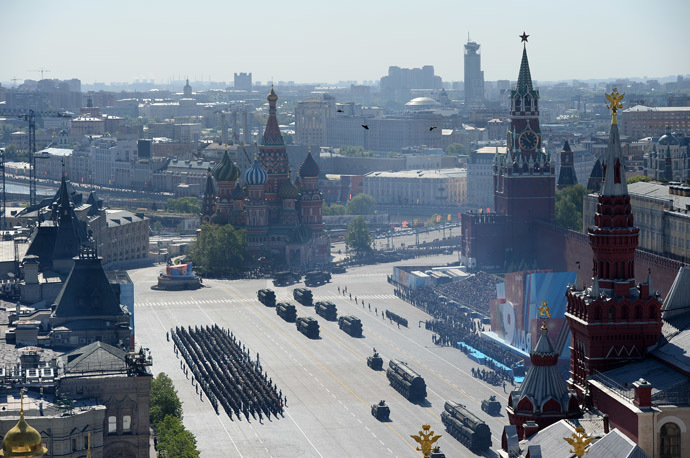 Triumf S-400 anti-aircraft missile systems and Topol-M intercontinental ballistic missiles during a parade marking the 69th anniversary of the victory in the Great Patriotic War, on Moscow's Red Square. (RIA Novosti) GAZ -2330 ‘Tiger’ combat cars have opened the mechanized column of 149 units, which was the largest to participate in the Victory parade since the fall of Soviet Union in 1991. The traditional participants of the May 9 celebrations – BTR- 80 and BTR-82A armored vehicles, T-90A tanks, Buk- M2, C-400 and Pantsir S1 antiaircraft missile systems, tactical Iskander-M ballistic missile systems and Topol-M intercontinental ballistic missile systems – have made yet another appearance on the Red Square. But there were also military vehicles that Russia has never showcased at the parade before, including armored KamAZ-63968 ‘Typhoon’ combat cars, Tor-M2U antiaircraft missile systems, Khrizantema-S antitank missile systems as well as 2S19M2 Msta-S modernized self-propelled artillery guns. None of the historic vehicles from the WWII era participated in the current parade as the organizers decided to save them for the celebrations of 70th anniversary of Victory next year. The final part of the parade was the flyover, which involved 69 planes and helicopters to match the number of years passed since the victory over Nazi Germany. 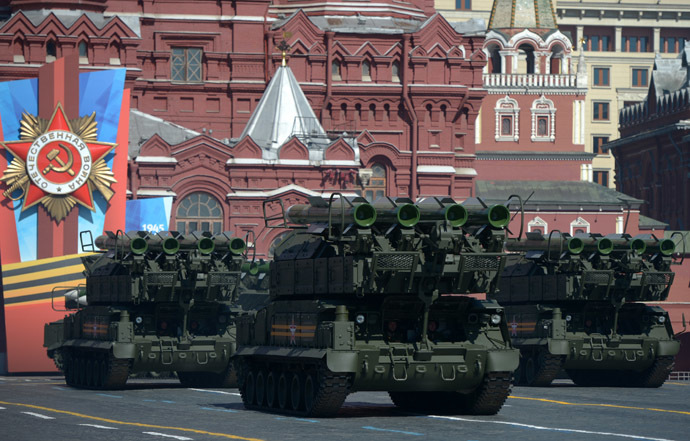 BUK-M2U surface-to-air missile systems during a parade marking the 69th anniversary of the victory in the Great Patriotic War, on Moscow's Red Square. (RIA Novosti) Su-24M and Su-34 bombers; Su-25 strike aircrafts; Su- 27 and MiG-29 fighter jets; MiG-31BM interceptors; An-22, An-124-100 and Il- 76MD military transport aircrafts; Il-78M fuel tankers; A-50 AWACS aircrafts, Tu-22M3 long-range bombers; Tu-95MS and Tu-160 strategic bombers, Yak-130 combat training aircrafts took to the skies in the Russian capital. The parade was concluded with six Su-25 strike aircrafts, which flew at an altitude of 300 meters, at a speed of 550 km/h, releasing red, white and blue smoke in the colors of the Russian flag. Victory Day is one of the most important holidays for Russia, as it marks the capitulation of Nazi Germany to the Soviet Union in the Second World War on May 9, 1945. The first parade to commemorate WWII victory was staged on Red Square on June 24, 1945, by order of Soviet leader Joseph Stalin. T90 tanks during a parade marking the 69th anniversary of the victory in the Great Patriotic War, on Moscow's Red Square. (RIA Novosti) The Soviet Union paid the highest price of any nation for this victory and lost over 26 million lives in the conflict, known as the Great Patriotic War in the former USSR. Military parades were held annually on Red Square on May 9, beginning on the 20th anniversary of the victory in 1965. The tradition was dropped for some years after the collapse of the USSR, in the beginning of the turbulent 90s to be revived in 1995.